Ink! No matter the printer you’ve got, whether it be inkjet, laser or otherwise, it’s the consumables that will send you broke. At times, the cost of Hewlett-Packard black ink has exceeded the price per volume of human blood, and shareholders around the world have rejoiced. As a retrocomputing reprobate, I have a personal dilection for printers of the vintage persuasion. My previous dalliances have involved fully fledged office copiers, but lately I’ve found myself tinkering with dot matrixes of a 1980s vintage. These workhorses are now reaching middle age, and as you’d expect, their ribbons are a little worse for wear after all this time. Replacements are cheap enough for the most common printers, but shipping takes weeks and hackers are an impatient bunch. Plus, if you’ve got one of the more obscure models, it’s unlikely you’ll find a fresh cart just sitting on the shelf. It was these factors that spurred my good friend [Cosmos2000] and I into action. [HomoFaciens] is always making us feel silly about our purchases. Did we really need to buy a nice set of stepper motors for that automation project? Couldn’t we have just used some epoxy and a threaded rod to make an encoder? Did we need to spend hours reading through the documentation for an industrial inkjet head? Couldn’t we just have asked ourselves, “What would [HomoFaciens] do?” and then made a jailhouse tattoo gun attached to a broken printer carriage and some other household tech trash? In his continuing work for his Hackaday prize entry, which we have covered before, his latest is a ink (…drop? ) printer. We think the goal is a Gingery book for CNC. He begins to combine all his previous work into a complete assembly. The video, viewable after the break, starts by explaining the function of a salvaged printer carriage. 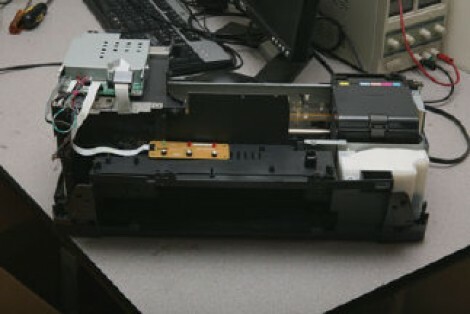 A motor attached to a belt moves the carriage back and forth; the original linear encoder from the printer is used for positional feedback. The base of the printer is a homemade y-carriage with another salvaged printer motor and encoder driving a threaded rod. The positional feedback for this axis is provided by a optical mouse gliding on a sheet of graph paper. The printer nozzle is a cup of ink with a solenoid actuated needle in it. When the needle moves in a hole at the bottom, it dispenses ink. As always, [HomoFaciens] makes something that is the very definition of a hack. Commenters will have to go elsewhere to leave their favorite debasement. Over the last few years we’ve seen a few commercial products that aim to put an entire PCB fab line on a desktop. As audacious as that sounds, there were a few booths showing off just that at CES last week, with one getting a $50k check from some blog. [Connor] and [Feiran] decided to do the hacker version of a PCB printer: an old HP plotter converted to modern hardware with a web interface with a conductive ink pen. The plotter in question is a 1983 HP HIPLOT DMP-29 that was, like all old HP gear, a masterpiece of science and engineering. These electronics were discarded (preserved may be a better word) and replaced with modern hardware. The old servo motors ran at about 1.5A each, and a standard H-Bridge chip and beefy lab power supply these motors were the only part of the original plotter that were reused. For accurate positioning, a few 10-turn pots were duct taped to the motor shafts and fed into the ATMega1284p used for controlling the whole thing. The final iteration of hardware wasn’t exactly what [Connor] and [Feiran] had in mind, but that’s mostly an issue with the terrible conductivity of the conductive ink. They’ve tried to fix this by running the pen over each line five times, but that introduces some backlash. This is the final project for an electrical engineering class, so we’re going to say that’s alright. The perfect balance of simplicity and complexity have been struck with this automated artist. The Roboartist is a vector drawing robot project which [Niazangels], [Maxarjun], and [Ashwin] have been documenting for the last few days. The killer feature of the build is the ability to process what is seen through a webcam so that it may be sketched as ink on paper by the robotic arm. The arm itself has four stages, and as you can see in the video below, remarkably little slop. The remaining slight wiggle is just enough to make the images seem as if they were not printed to perfection, and we like that effect! Above is a still of Roboartist working on a portrait of [Heath Ledger] in his role as Joker from The Dark Knight. The image import feature was used for this. It runs a tweaked version of the Canny Edge Detector to determine where the pen strokes go. This is an alternative to capturing the subject through the webcam. For now MATLAB is part of the software chain, but future work seeks to upgrade to more Open Source tools. The hardware itself uses an Arduino Mega to take input via USB or Bluetooth and drives the quartet of servo motors accordingly. Why spend time etching circuit boards and applying solder masks when all you really need is a rollerball pen and some paper? That’s what University of Illinois professors [Jennifer Lewis and Jennifer Bernhard] were asking when they set off to research the possibility of putting conductive ink into a standard rollerball pen. The product of their research is a silver nanoparticle-based ink that remains liquid while inside a pen, but dries on contact once it is applied to a porous surface such as paper. Once dry, the ink can be used to conduct electricity just like a copper trace on a circuit board, making on the fly circuit building a breeze. Previous ink-based circuit construction was typically done using inkjet printers or airbrushing, so removing the extra hardware from the process is a huge step forward. The team even has some news for those people that think the writable ink won’t hold up in the long run. The ink is surprisingly quite resilient to physical manipulation, and they found that it took folding the paper substrate several thousand times before their ink pathways started to fail. While we know this is no substitute for a nicely etched board, it would be pretty cool to prototype a simple circuit just by drawing out the connections on a piece of paper – we can’t wait to see this come to market. Here’s a step-by-step guide for printing etch resist directly to copper clad boards. Two methods of making printed circuit boards at home have long dominated as the favorites; using photo-resist, and the toner-transfer method. The latter involves printing board artwork on a laser printer and then ironing it onto the copper clad. We’ve seen some efforts to print toner directly to the copper, or to use ink to adhere toner and then heat fuse it, but this hack is the first one we remember seeing that uses an inkjet printer directly. The best reason inkjet printing isn’t often used is do to the ink’s iability to protect copper from the etchant. This method uses MISPRO ink that is pigment based and will resist the acid. An Epson Stylus Photo R260 printer was chosen because you can get refillable printer cartridges which work with the ink, and they’re fairly easy to modify. In order to feed substrate through the device it needs some physical alteration to make room for the thickness of the material, and an ATtiny13 has been added to trick one of the sensors. Unfortunately we didn’t find photos of the printed resist. But there is source code available for the tiny13 if you do give this a try.